I don't need to go too much into Listia. I think we all know what it is, and how it works, blah blah blah.... I think we also know that people on there are frigging out of their minds thinking some '90 Score card of Brian Holman is worth 499 credits. Free or not - that's real money in my book. But, from time to time, something will come on Listia that makes it worth the effort. This is the culmination of one of those times. See, about a month back, an auction hit for a Panini National Trasures booklet of Lance Berkman. Now, there isn't a binder on Lance here at Casa Dos por Tres. 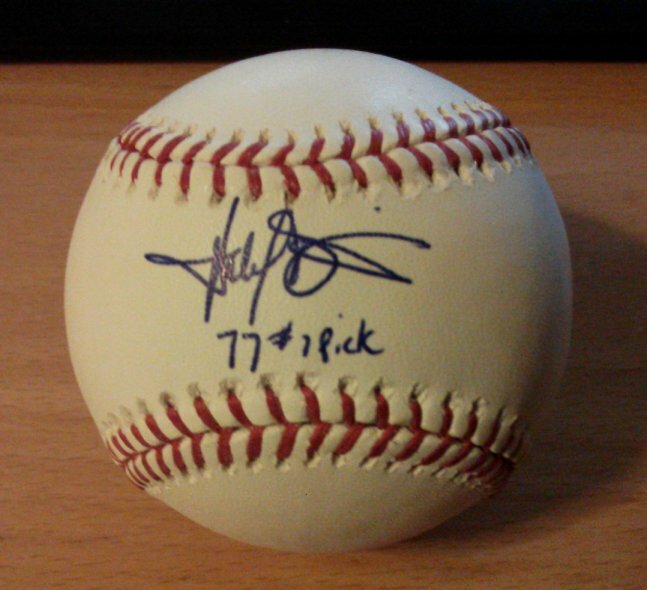 However, there is an avid collector of Mr. Berkman in Alabama. Here's what was listed. ....only to learn it was already promised to someone else. CURSES!!! I'll get you next time, Plaschke! And your fantasy wife too! Errrr.....well that didn't scan so well. Let me try this another way. Ahhh - much better. My original plan was to swap the booklet for a Pee Wee Reese relic card. 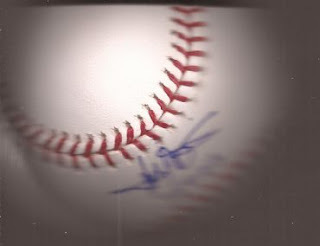 After that fell through, Sam offered a TriStar certified autograph of Harold Baines. Well hell yeah! This is my first autograph on a baseball, and I couldn't ask for a better player. So, children, what have we learned? Free can be pretty dang cool. Damn. So much for sending you that 1960 Earl Battey card. Man, I really hope you didn't do that many surveys. I almost clawed my eyeballs out doing those things. "Don't be afraid of your freedom!" Words to live by. Awesome to last a lifetime.